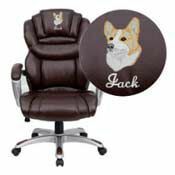 Custom office chairs can take your corporate branding to the next level. 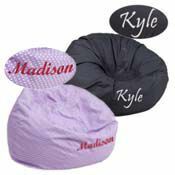 Choose your own design to be embroidered on your headrest for a complete, personalized look. 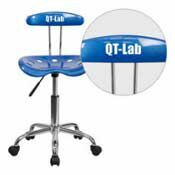 Personalized chairs for the office offer all the ergonomic support you expect alongside a complete custom appeal. 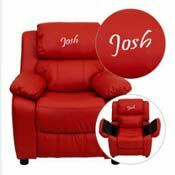 You can add a personal logo, text or combination to be embroidered directly onto the headrest of each seat. 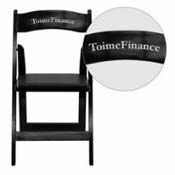 Shop personalized executive chairs to customize each desk space throughout your office. Available in either soft fabrics or fine leather, these chairs also come in a range of styles and hues to match your company’s colors. 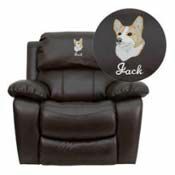 Our task chairs can also be customized with UV-resistant vinyl lettering for a look that lasts. Ideal for a range of work and learning environments, these task chairs are available in vibrant colors to uplift your workspace. 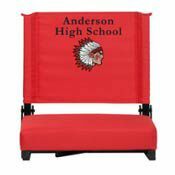 Personalization is also available for stacking chairs and folding chairs, so you can brand an event of any kind, from the conference room to the cafeteria. Our simple personalization process is completed entirely online, making it fast and easy to get the exact look you want. Just select your desired font and color for text and view a mock-up version to review prior to ordering. 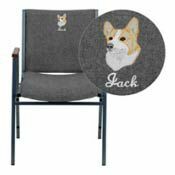 If you want an embroidered image in addition to or in lieu of text, you can upload your own file or choose one from our expansive gallery. Getting embroidered chairs for your office is easy. 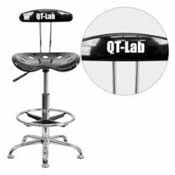 Shop online now to find the best custom office chairs for your business.